It is impossible to overstate the cultural significance of the four men described in Don Lattin's The Harvard Psychedelic Club. Huston Smith, tirelessly working to promote cross-cultural religious and spiritual tolerance. Richard Alpert, a.k.a. Ram Dass, inspiring generations with his mantra, "be here now." Andrew Weil, undisputed leader of the holistic medicine revolution. And, of course, Timothy Leary, the charismatic, rebellious counter-culture icon and LSD guru. Journalist Don Lattin provides the funny, moving inside story of the "Cambridge Quartet," who crossed paths with the infamous Harvard Psilocybin Project in the early 60's, and went on to pioneer the Mind/Body/Spirit movement that would popularize yoga, vegetarianism, and Eastern mysticism in the Western world. Many of the stories in this book have been told elsewhere, but Lattin tells them with new energy and weaves them together to create a satisfying narrative that re-creates and explains the era. In this beautifully constructed study, Lattin brings together four of the most memorable figures from that period…this is a fast-moving, dispassionate recounting of a seminal period in our history, and all in all, a wonderful book. A terrific social history of a fascinating historical period . . . laugh-aloud passages make this an entertaining read. With care and considerable humor, Don Lattin shows us how the interwoven relationships of four charismatic visionaries contributed to the expansion of mind that changed American culture forever. The way we eat, pray, and love have all been conditioned by their lives and teachings. I suspect I’m not the only person who thought the psychedelics-at-Harvard story had been pretty well settled, but Lattin’s work has widened my perspective considerably. By focusing on Huston Smith and Andrew Weil as well as Leary and Alpert, he’s created a stimulating and thoroughly engrossing read. 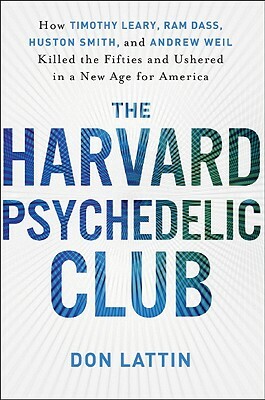 The Harvard Psychedelic Club is not only a great read, it’s also an unforgettable head trip. Lattin weaves a masterful tale of 1960s-style spirituality, professional jealousy, and out-of-body experiences. Lattin has done his homework and it shows. Read this book and expand your mind. No hallucinogenics required. A revealing account of four iconic personalities who helped define an era, sowed seeds of consciousness, and left indelible marks in the lives of spiritual explorers to this day. The Conclusion is alone worth the price of the book.